In 1889, Andre and Edouard Michelin founded a tyre company, Michelin, which has now become a globally recognized brand. It accelerated the automobile industry in a time when there were fewer than 3,000 cards where it was established, in France. For the company to grow, it had to win the hearts and minds of this very small target market of motorists and find similar audiences keen to aspire to own their own automobile. It also had to offer some creativity and inspiration as to what owning an automobile would allow you to do. One such creative idea was to inspire the idea of taking road trips and look at how these trips could be transformed into an adventure, giving a reason for people to explore the country. This is how the idea of a guide was produced by the Michelin brothers providing listings of places to eat and stay. The guide grew in influence with the restaurant guide, which began to establish its own awareness through the introduction of ranking the establishments based on stars, transforming the Michelin Guide into a global bestseller. And the purpose of the Michelin Guide? To provide a reason for automobile owners to get in their cars and plan excursions, but, more importantly, to drive up the sales of car tyres. It’s a great example of the Michelin brand finding an angle in an uncontested marketplace to not only reach new audiences but tap into and develop a story that connected back to the very reason the organization was in business – to generate sales of tyres. Many brands can learn from this approach, especially when it comes to the opportunities offered by content marketing and using this approach. Perhaps you work in an organization that’s operating in a heavily competitive marketplace and there is an opportunity to create new uncontested markets for your business to manoeuvre into through a content marketing strategy. Is a content marketing approach the right fit? First, it’s important to understand whether a content approach is right for your organization. In other words, is adopting this approach going to help and support you in meeting your organizational goals? The successful content strategies that stand the test of time have been built from the outside of an organization looking in. In other words, the prime motivation was to help and assist the needs of their audience, putting the customer’s needs at the heart of a company-wide strategy. In the case of Michelin, this meant creating a need or desire that, in turn, supported the business' goal of selling more tyres. This led to the Michelin guide becoming a USP that involved the entire organization and helped position the brand through content. A recent survey of UK content marketers by the CMI suggested that 86% of respondents agreed that their organization uses content marketing. However, 57% agreed that the team in place to support this approach is structured as a small or one person team to serve their respective organization. This suggests that content is being treated as a siloed operation within the majority of UK businesses, especially when we take into account the fact that only 30% of respondents agreed their company was committed to content marketing and 38% of organizations had a documented content marketing strategy. It is recommended that you step back from the tactical elements of content and understand if there is a need, through content, that is going to help you meet your business objectives and how these are going to be measured. There appears to be a need for better education and training within companies to improve understanding of the opportunities a content approach can create. This will also show that there is an underlying need for a robust foundation to be put in place before you even consider introducing the tactical elements of content marketing and the metrics measured to assess its impact. Santander recently launched their very own digital academy to help provide learning modules to their employees with the objective of upskilling and education. It also supports progression in employees looking to create digital careers. Building a robust training program doesn't just support the development of the individual through marketing qualifications, it also helps upskill and educate the company they work for. It does this by helping to augment organizational culture by instilling the right skills, attitude and willingness to engage in improving marketing activities. Taking the approach of a tailored training program that fits the needs of your organization to help upskill your workforce, we can use the example of content strategy. Training and education can help explain that content is more than just a tactic or a siloed team running a campaign with a start and end date. A content approach is, in fact, a discipline that enables you to connect your wider business and potentially create and redefine new markets and opportunities, as the Michelin example proves. So, the groundwork should be completed to understand if there is an opportunity for content. The next step is to ensure you have organizational buy-in and your company has clarity as to the strategy and reasons behind a content strategy. As this point, it’s essential to have a sponsor or supporter within your board of directors for this approach. 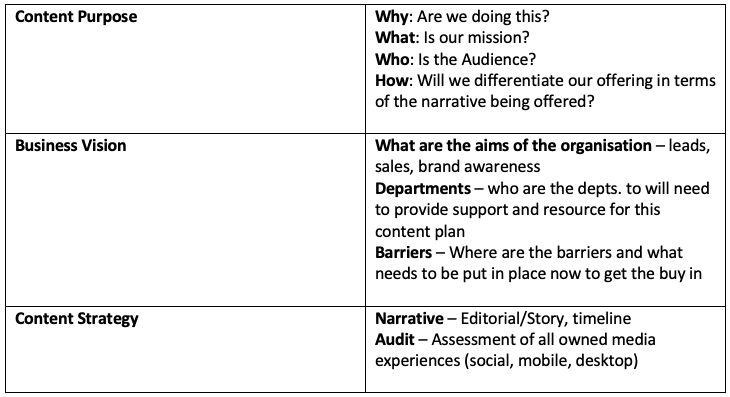 Below is a proposed framework you could consider using that aligns the content strategy to your business goals. Are you starting your content approach with your customer? Otherwise known as market orientation, where your business understands the needs of its customers and the market it operates. It is also the foundation of any marketing strategy – introducing your customer to the organization. Customer Service: Operating as the gateway to the organization, customer service should provide you with a rich source of insights. What are the common questions, concerns and challenges that seem to be on the agenda? Speak to your audience: The best insights will come from speaking to your audience directly. Consider segmenting your customer base into current customers, loyal customers and customers who no longer buy or engage from you. Map out commonalities or specific differences from the types of customer segments. From listening and understanding who your audience is and the market you operate in, can you begin to define segments of your audience where there is a need for a content approach to service their need or requirement? What seem to be the burning issues and questions posed that you could create a service for? Assess your branded platforms e.g. online/offline and understand the types of audiences that use these channels. This could be through demographic information or the psychographics (e.g. their attitudes). Doing so means you are better able to assess the market your organization operates in and where there may be an opportunity to position your company. How are you going to position your brand? Assuming there is an opportunity through content, how could this be realized by your organization and how could your company fill this gap? The grounding you have completed through customer research and understanding your audience should provide you with plenty of insights and opportunities to begin to create content. From here, there are a number of tools that can be used to accelerate the audience insights and help to identify content themes such as the following. Go to Search Console and assess how users are finding your site through non-branded search terms. Is there an opportunity here to build out more content themes on certain content areas not associated with your brand name? For example, on my personal site, I have a diary of my Lands End to John O Groats (LEJOG) cycle. 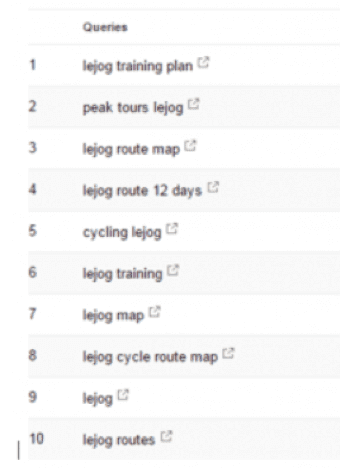 If I wanted to expand content ideas around "LEJOG", I can filter search queries by LEJOG as below. Search Console will now display all "LEJOG" queries that drove clicks to my blog. I can then filter these results based on what devices are used when clicking through to my site. From here this could provide me with a host of content ideas to expand on should LEJOG be a key content focus for my site. The same logic could also be applied to your business based on the sector you operate and if you’re looking to create specialized content. Sites such as SEMrush provide you with an opportunity to compare your site with a competitor and identify any gaps you have versus them, providing you with content creation opportunities. By simply adding your site and adding in a competitor site, SEMrush will provide a list of keywords where one ranks or fails to rank. From here there is an opportunity to identify content opportunities. Although a strategy should not be defined by social vanity metrics, these insights can provide indicators as to what content resonates both in what your organization produces and your competitors. A tool to help accelerate your understanding of the social media landscape is URLProfiler. URLProfiler provides the ability to combine link metrics and social data, such as social share counts per URL and social account URLs. The tool provides a way to audit social data from different datasets such as the number of tweets featuring a URL. River Pools used libraries of customer research and questions asked to brainstorm the major challenges and requests from customers visiting River Pools showrooms or engaging with the brand via social media and the phone. Armed with this long list of intelligence, they set about turning this into content via a company blog that answered the most common questions people had about swimming pools. By putting the customer at the centre of their strategy, the organization transformed and became a centre for anything to do with helpful advice for those considering purchasing a swimming pool. You need to make sure that your content strategy's success it tied back to your business goals. In other words, what it the intention of your organization – to drive sales? To drive leads? To build Brand awareness? From here then you can ensure the right metrics are in place to measure the effectiveness. Take a step back and ask yourself if the role of content has a part to play in supporting your business objectives. For Michelin, adding a narrative that connected the sales of automobile tyres to something that would interest its target audience helped the company to create inspiring content. This also enabled the company to create an opportunity within its niche, as well as content that has stood the test of time and is a good talking point for its audience.